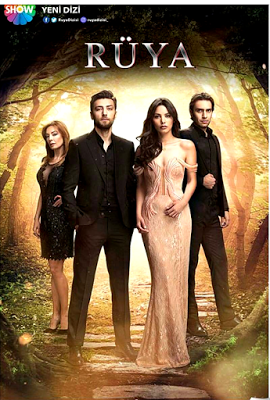 Pagina de pornire Burak Özçivit Celebrity News EN Fahriye Evcen Turkish Celebrity News Wedding Celebrity News: Burak Özçivit and Fahriye Evcen got married! 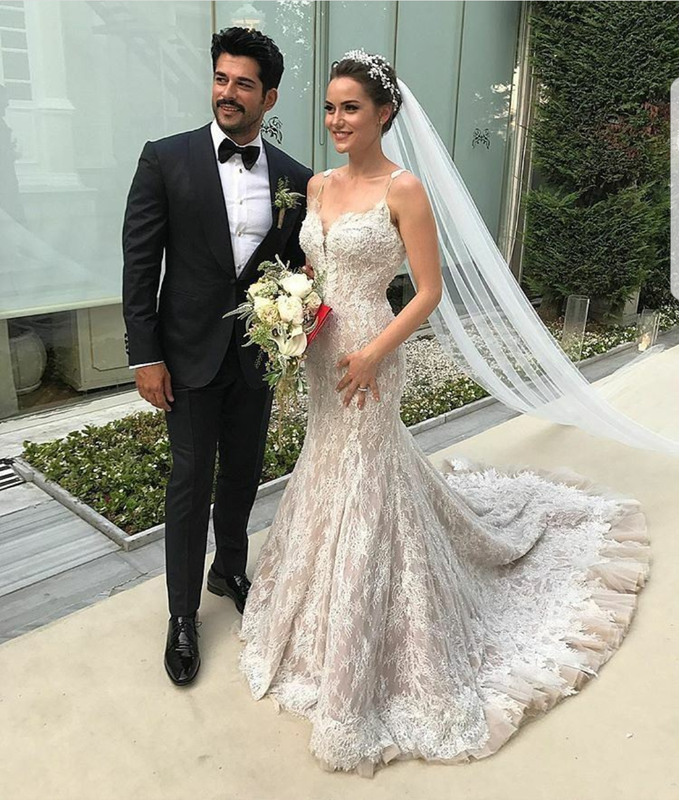 Celebrity News: Burak Özçivit and Fahriye Evcen got married! 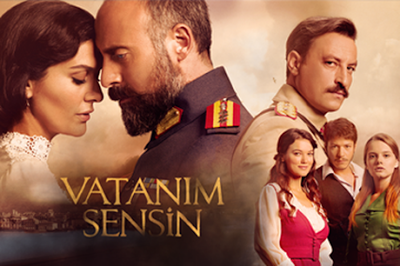 Sait Halim Paşa Yalısı Maison hosted the wedding of the year! 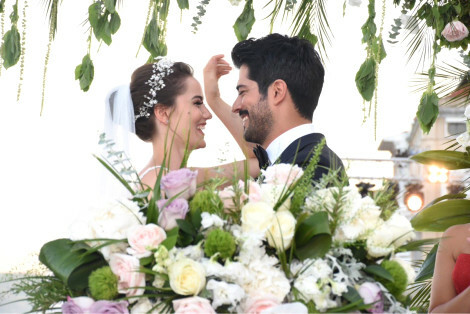 June 29, 2017: The big day has arrived for the most adorably in love couple in Turkey today, Fahriye Evcen and Burak Özçivit who have organised the wedding of their lives. Everyone was eager to see both the bride and the groom. The famous couple dedicated their attention to the long-awaited event and carefully selected every detail, starting with the bridal gown, the costume of the bridegroom, the location, the decorations, the flowers and the music because all these aspects are important for the wedding to be a dream. Accessories were created in Izmir by Sanem Sevgen a shoe designer at the famous couple's wishes, who wanted as the seven ladies of honour to have these robes and slippers as well. Sanem Sevgen designer especially makes customised bridal shoes and famous couple's shoes have been created 100% manually. Bridal shoes were accessorised with pearls and crystal stones, and sandals with pink-colored drop and crystal stones on the heels. Fahriye Evcen is incredibly beautiful and the bridal dress looks sensational on her. How beautiful Fahryie, any model you choose will look sensational. Precious lace and siren crochet are the fingerprints of femininity! In the photo posted on Instagram, Fahriye evokes a beautiful bouquet of flowers, she is incredibly beautiful and the bride dress reveals the perfect silhouette and waist. Neither was the groom left out! 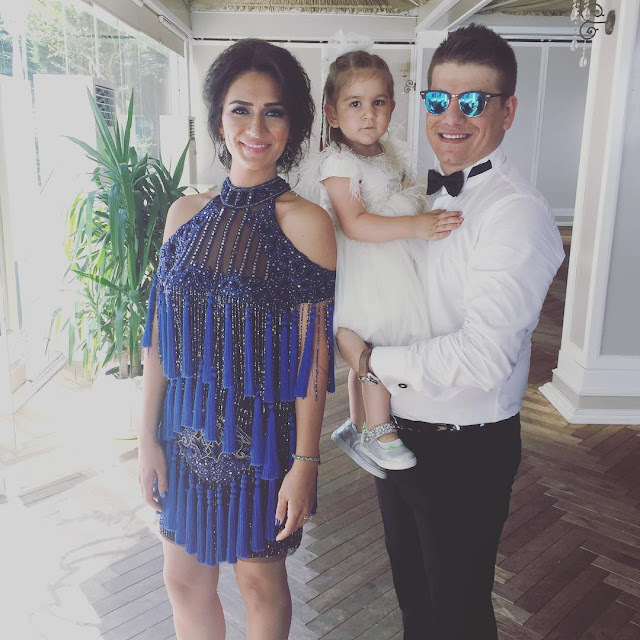 While Fahriye came out in obvious grace to the bride dress with an impressive design, the groom also opted for a special dress. The groom costume of the beautiful actor has an impressive modern look. The bride wore a custom-made gown by Raşit Bağzıbağlı and the groom costume was created by Raşit and Derviş Bağzıbağlı (dad and son). The groom's family was ready for wedding from early morning, both the parents and Burcun Ahmet, Burak's sister are present in the mansion. 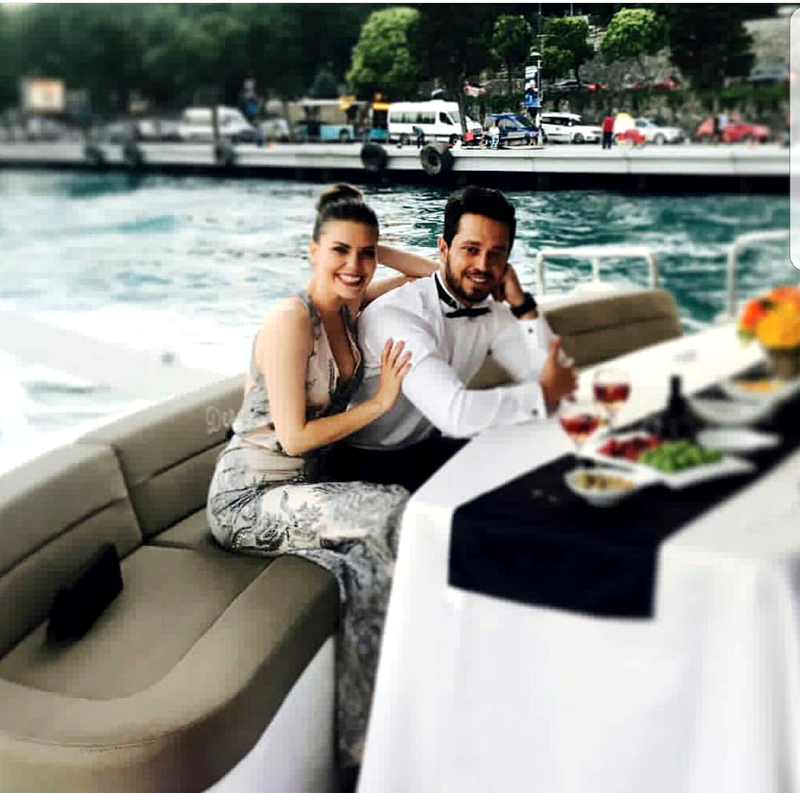 There were invited many celebrities to their wedding: Kerem Bursin & Serenay Sarıkaya, Hatice Şendil & Burak Sağyışar, Aslı Enver & Murat Boz, Kenan İmirzalıoğlu & Sinem Kobal, Ebru Akel and many others. The tabloids in Turkey have written about the likeness of the beautiful bride, Fahriye Evcen with the dress carried by Neslihan Atagül at the wedding with Kadir Doğuş Doğulu. 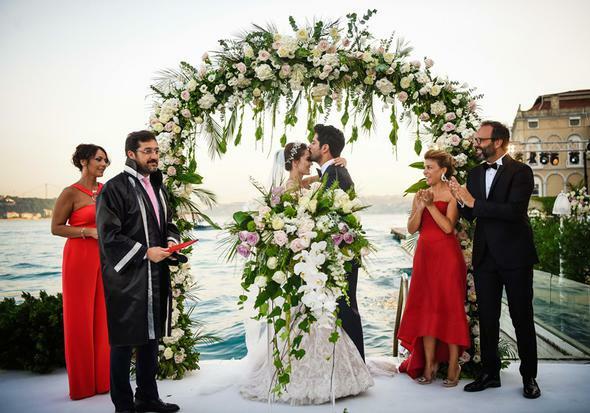 Many famous actors attended in Sait Halim Pasha's wedding, but the famous couple Kadir Dogulu and Neslihan Atagül did't take part in the big event. But few days ago they said in the press that they wouldn't attend the wedding because they would be on vacation. 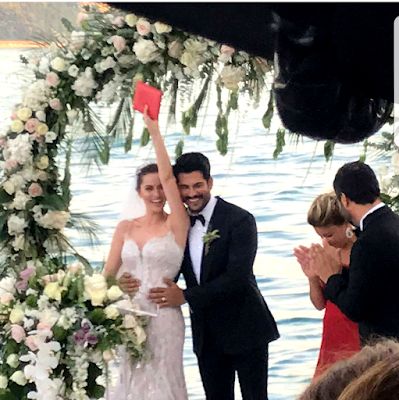 Fahriye Evcen and Burak Özçivit said "YES" forever swearing eternal love. 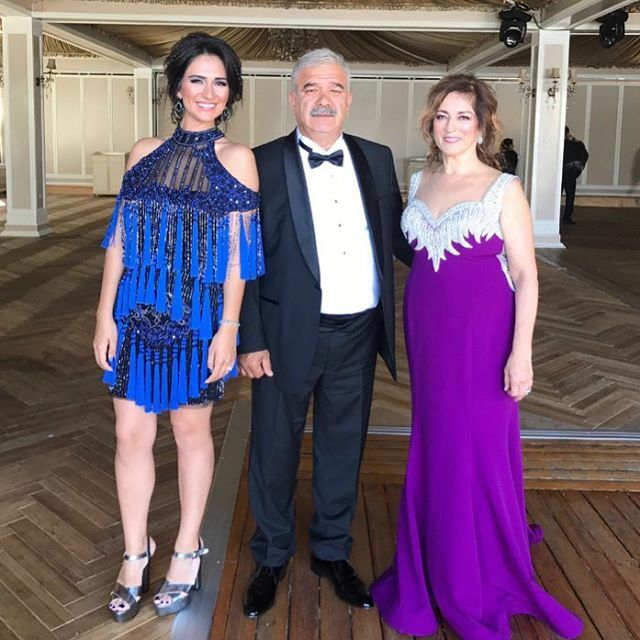 The beautiful bride Fahriye Evcen wore three dresses at the event of the year! 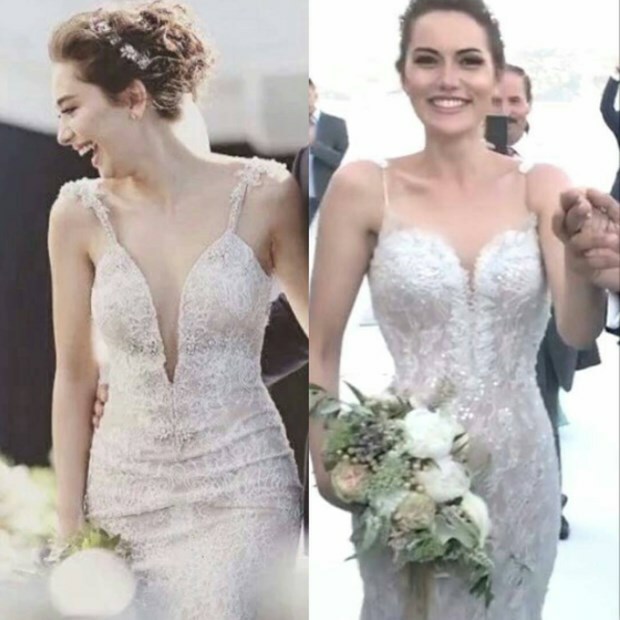 Here's how it looksthe bridal dress of the beautiful actress Fahriye Evcen! Wedding details of Burak Özçivit and Fahriye Evcen! There were invited many celebrities to their wedding: Kerem Bursin & Serenay Sarıkaya, Hatice Şendil & Burak Sağyışar, Aslı Enver & Murat Boz, Kenan İmirzalıoğlu & Sinem Kobal, Ebru Akel and many others. 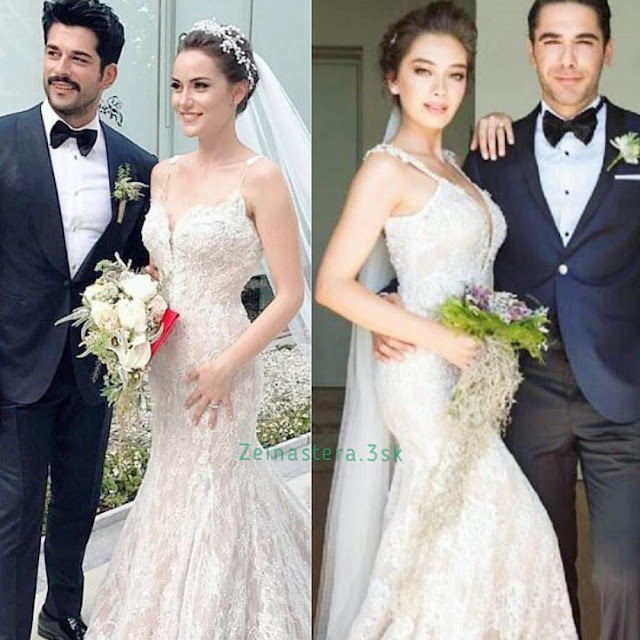 The beautiful bride Fahriye Evcen wore three dresses at the event of the year!